If you’re visiting Las Vegas and a curious hiker or cyclist you’ll want to see what’s beyond the Scenic Loop at Red Rock Canyon National Conservation Area. You’ll drive past Bonnie Springs, follow beautiful scenery and trails until you reach the gem of a small village, Blue Diamond. According to a 2010 census the population of Blue Diamond was 290. You’ll find a post office, church, bike shop, general store, a skate park, children’s playground, school, and McGhie’s Bike Outpost and a lot of burros wandering around. McGhie’s Bike Outpost has a full service center for your bike, apparel, snacks to get you through the trails. 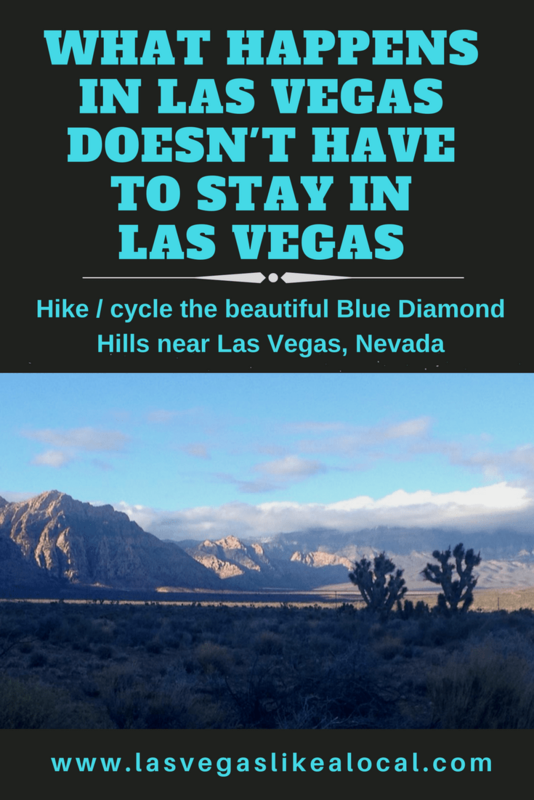 The staff are great and will recommend the best trails to ride around the Blue Diamond area and anywhere else around the Las Vegas Valley. They’ll be able to advise you on great trails to hike. The Village Market & Mercantile is the (only) spot to grab groceries, a sandwich and a cup of coffee. After a long ride, you can sit down on their porch and relax in the beautiful quiet of this amazing village. The village of Blue Diamond is a gypsum mining town, originally known as Cottonwood Springs and renamed in 1923. The town was named after the Blue Diamond Company, the mining company that purchased and took over the land. 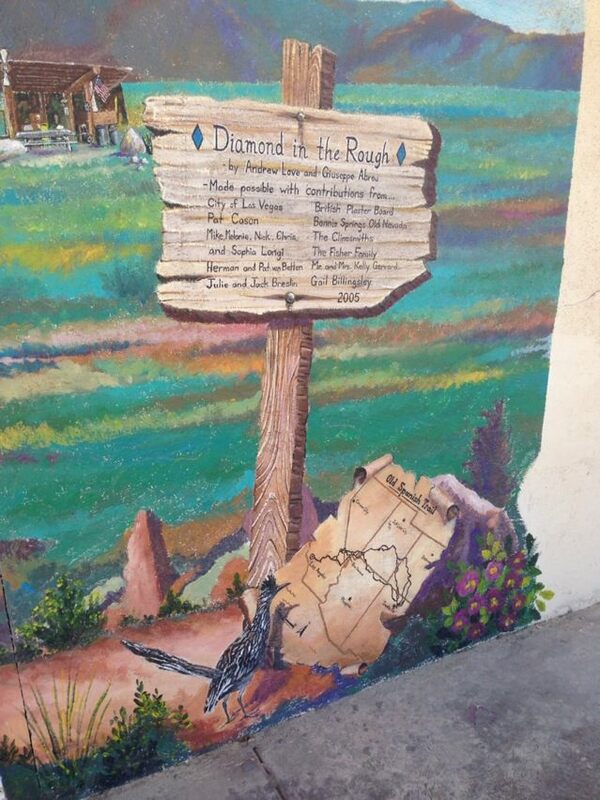 A mural with history in the town of Blue Diamond. At the bottom right you’ll see a map of the Old Spanish Trail. In the mid 19th century, Cottonwood Springs was a stop for traders who were traveling between New Mexico and California. Cottonwood Springs was renamed to Blue Diamond in 1923. The company operated a mine, housed workers and families at the mine site and shipped gypsum by rail to Los Angeles until they built a local plasterboard mill and a plant in 1941. They leased the Cottonwood Ranch property and, to accommodate the increased work force, built housing and a community there named Blue Diamond. Blue Diamond was a company owned town until 1965 when properties were sold to the public. A Housing Development in the Blue Diamond Hills? There’s a controversial plan to create a development of 5000 homes on Blue Diamond Hill. The area is just 3 1/2 miles from the entrance of the Red Rock National Conversation Area. The plan has been in the works for 10 years. Not surprisingly, it’s an unwelcome proposal with nearby communities deeply concerned about the environmental impact from destruction of habitat and ecosystems to pollution, as well as the cost of creating a water supply and high increase in traffic volume through this former mining region. In the wake of controversy surrounding a proposed development within eyesight of the Red Rock Canyon National Conservation Area, Nevada lawmakers have reintroduced a bill that would essentially freeze any private development within a five-mile radius of a national conservation area. What Next for You and Blue Diamond? Simple, run don’t walk to visit the beautiful village of Blue Diamond. It’s a place that restores your faith in humanity, with its friendly residents and everything in walking distance. It’s a magical spot, let’s hope it gets to stay that way. Next Next post: Want the Best in Las Vegas? Las Vegas Weekly’s Got the List!